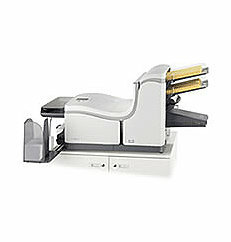 The Formax 6202 Series inserter brings advanced folding and inserting technology to the office environment. This machine has a unique AutoSet feature which provides a one-touch setup of new jobs by automatically measuring paper lengths, envelope sizes and fold lengths. Recurring and frequent jobs run in AutoSetTM can also be stored as a programmed job setting for hassle-free setup and operation. The powerful folding system enables the 6202 Series to accurately fold up to five sheets of paper at the same time! The FD 6202-Advanced 2 comes with two sheet feeders and one insert/BRE feeder. The 6202 Series is available in four models to meet your specific processing needs. A variety of documents up to 14” long, including checks, invoices, newsletters and reply envelopes can be inserted in almost any combination. An optional left or right side exit tray can be added to maximize operator productivity. The daily mail feature allows for various mailings to be processed in stapled and non-stapled sets. The 6202 Series processes at a rate of up to 2,200 pieces per hour and can handle up to 325 sheets in each feeder. Feeders can be refilled on-the-fly allowing for continuous operation. The cascade mode maximizes production of the models with two sheet feeders by filling both feeders with the same documents. When one feeder empties the other automatically starts feeding. This feature allows for a total input capacity of up to 650 sheets. The enhanced folding system is capable of folding and inserting up to five documents at one time. The 6202 Series has double document detectors located at each feed station to ensure document integrity. The optional OMR software and hardware (available only on the FD 6202-Advanced 2) allow for the automatic insertion of varying multiple page documents, up to 5 sheets. OMR determines which documents go together into each envelope, eliminating the tedious task of manually collating and inserting. The AutoSet feature automatically detects and sets paper length, fold type, envelope size, fold length and double document detection. Simply load the documents into the feed hoppers and go. The 6202 Series also includes nine programmable fold settings for recurring or frequently processed applications. The drop-in feed system and easy-access paper paths increase efficiency and maximize output. The Formax 6202 Inserters are easy to use, flexible, powerful and secure and would be a great addition to any office environment. If you have any questions or are interested in purchasing the Formax FD6202 Inserters, visit us at SpiralBinding.com. We have great pricing on a full line of Inserters. Call us at 1-800-631-3572 for more information!